I've connected four YL-69 sensors to my arduino at-mega2560 on analogs pins 0-3. This is combined with four DHT11 sensors that are in digital pins. The DHT work fine, and I can work one YL-69 moisture sensor that gives correct readings. But when I connected the others, the readings are just 100% for all. I'm sure I must have made a mistake in my code somewhere, just can't spot it. I've posted the sketch I use below, and the results from serial monitor. (BTW i added a short delay of 10ms between each reading thinking that may be the issue, but it had no effect). //  if any result below is NaN (not a number) then something went wrong! Not the answer you're looking for? Browse other questions tagged arduino-mega sensors c++ or ask your own question. 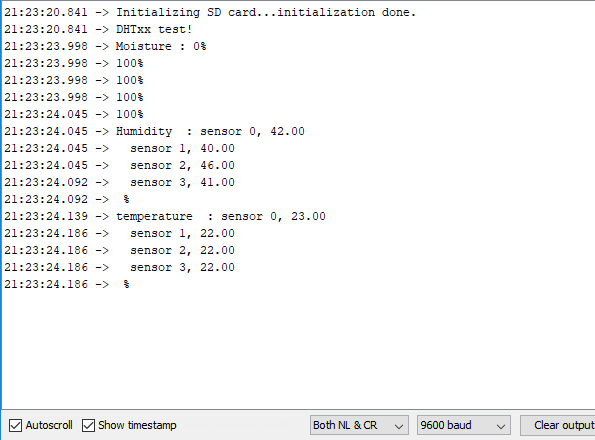 Moisture sensor data will not output data to Serial Monitor? Program hangs at am2315.begin() - ideas?